Straight out of the green fields of Hershey Pennsylvania comes this imperial style IPA with a sensational reputation that ripples over the Rocky Mountains to Oregon and back at yah, like a fresh slap on the buttocks. Forms a tasty a refreshing island of intense Imperial smoothness unaccounted for in my experience of this style. Wait, pinch me, is this a pale ale? Let's see, 7.5ABV and 85IBU, if truth is told, how can this be? You know what I think? This is one of those rare forms of near perfection that gracefully and modestly comes up with a little bare shoulder strap down and teases you with a wink, which surprises you, and then shockingly, and may I venture to say, erotically, grabs a good chunk of your arm or something, and presses up covertly against you with a sigh, causing all self doubt to evaporate into a mushroom cloud of, "woah dude!". This is like a cool snowflake of hop juice landing on the palette. Melting. Yes, like a bitchy strawberry blonde, the lingering bitterness is ironically sweet. The rusty old taste buds on the back of my tongue are scraped clean and they wake up! This ale is like a bright clear morning in spring. Fresh and clear. This is an example beautiful symmetry where the sum of scent and taste is equal to the mouthfeel and finish. It culminates into a perfect lingering smooth bitterness which cleanly introduces the consequent quaff, so prim, so good, so inoffensive, so peaceful, so modest, leading to the flirty tease, the little cheek, this little reveal, and again in ambush, yet apparently contrived and delivered with devastating timing, the quick intense and secret wet, wet, kiss. Is anyone looking? I think I might be blushing. This IPA wants to go out with me - I am lead to believe. I've got a crush on your IPA. Solid as a rock... and nothing's changed. But the thrill is still, hot. I'm not sure if this is underrated; quite frankly, I don't care. I enjoy its balance, as much as I enjoy the subdued citra hops on the finish. Not overly bitter, despite the abv. There's an intelligent balance on this one for sure. I'm glad that it's now readily accessible in my area. Overall - One of the better, everyday, readily available IPAs on the shelves. Reliable, refreshing and always good. BOTTLE: 12 fl oz. Brown glass. Great label art & design. Branded pry-off pressure cap. Purchased at a bottle shop in New York City for $2.29. Expectations are high given the brewery. Served cold into a pilsner glass at low altitude in Austin, Texas. Reviewed live as an IPA per the label. HEAD: 2 fingers in width. Off-white head. Has an even consistency and a nice complexion. Frothy and soft-looking. Ample lacing sticks to the sides of the glass as the head recedes. Head retention is superb - about 8 minutes. BODY: Clear vibrant yellow-copper. Translucent and transparent. Clean; there are no visible yeast particles. Appears well-carbonated. Overall, it's a solid albeit typical appearance for an IPA, but it's not unique or special. Has no obvious flaws. AROMA: Fruity, with some rindy bitterness alongside melon, mango, pine, and faint tangerine. Pale malts check the hop bitterness aptly. I dig the hop profile, but it's not the most expressive aroma in spite of its moderate intensity. I like that there's no overly sweet caramalt, and this does suggest a balanced brew. The hop profile isn't highly citrusy, nor is resinous, dank, herbal, or sprucey. Overall, it's a pleasant inviting aroma, with a clean presentation devoid of any yeasty notes or off-character - though the alcohol isn't unnoticeable. TASTE/TEXTURE: Clean and crisp, with a smoothness and wetness that underscores the lightly oily hop profile comprised primarily of fruit with notes of mango, faint rind, some tangerine, and floral notes. It's not the fresh juicy citrusy flavour profile I tend to go for in IPAs, nor is a grapefruit bomb or a resinous piney brew, but I do like it. The simple but effective pale malt core hides any hop bitterness, leaving this with no bite but plenty of flavour. This fundamental balance is the beer's key strength. Discerning drinkers will crave still more complexity, depth of flavour, and subtle layering of flavour, but it doesn't disappoint in any category. Flavour duration and intensity are average. It's a well-built IPA but features no stand-out characteristics. Very likable and approachable. It's a biteen overcarbonated, with a medium body and moderate thickness. Overall, this texture complements the taste well but it fails to elevate the beer, and I don't consider it too refreshing. A lighter body and more refreshing presence on the palate would do it well. OVERALL: More good work from Troegs. Perpetual IPA is a good go-to beer in the style with a balanced flavour profile and plenty of complexity. While it lacks the intricacy and depth to compete with world-class offerings, it's a solid standby and I'd put it on regular rotation in my fridge if I had ready access to it - though I hope it doesn't run $2.29 a bottle everywhere in its distribution zone. Absolutely worth trying and highly drinkable. I'll enjoy finishing my glass and wish I had more. One thing is for certain - I need to try more Troegs. Pours a bright yellow gold with a creamy white foam head. Smells like buttery pears, faint pineapple, and honey grains. The taste is slightly bitter and hoppy with honey, pineapple, lemon, and bready malts. Medium body with moderate carbonation. Creamy and smooth. Overall a delicious and bittersweet IPA. Appearance- A clear golden color with a small white head. Palate- A light to medium bodied beer with moderate carbonation. Has a dry finish with a slight bitter aftertaste. Overall- A well balanced double IPA. I will drink this again. A - Mostly clear, golden orange with a two finger fluffy head and a slight haze. T - Follows the nose, with some bready malts, and a piney bitter finish. M - Carbonation medium low, smooth. this was a let down for me a little bit. just found it to be a little weak and lackluster. the pour was a really clear light golden color, with a small but lacey white head with reasonable retention. the nose exudes bitter hops, but they seem stale or distant or something, and the malt profile is very light for a big ipa. flavor was fine, but not inspiring, light euro malt profile, with bitter hops starting in the middle and riding on through the finish and then some. some light fruity notes, but i found it all to be a little overwhelmed by the alcohol, which was rather brisk and forward for a beer not even 8% abv. not a bad ipa at all, but certainly not one in the top 10 percent. it was all up pretty average in my book, nothing to distinguish it at all form the masses. i know troegs can do more. BOD 8/19/14. Clear golden pour with a normal head. Excellent lacing, normal retention. Nose of tropical and citrus hops, with some pine in the background, over a light biscuit. Light medium body with a nice slick texture. Slightly above normal carbonation with a nice bit of effervescence on the finish. The excellent flavor profile is complex and a masterpiece of balance. It begins with a balanced blend of hop flavors that flow into a moderate bitterness, that has a spicy note, over a slightly sweet biscuit background. The middle is where the flavor components fade with the alcohol completely hidden. The finish effervesces nicely and leaves you with a nice slightly spicy pine bitterness that flows into grapefruit rind. Outstanding!! Appearance 4.25, Aroma 4, Flavor 4.5, Palate 4.25, Overall 4.25. A pleasant IPA, attractive in appearance and aroma. Alcohol is well hidden. Poured from 12 oz. bottle into pint glass. It pours a clear, golden-amber color with a finger of foamy, milk-white head and lacing. It smells of malt, grapefruit, lemon peel, tangerine, caramel, pine needles, and floral hops. The first taste is strongly grapefruit and lemon with subtle caramel and tropical fruit sweetness. The hops bite hard and it finishes crisp and bitter. It features lively carbonation and the 7.5% ABV gives it a kick without being overwhelming. Overall, this is a very pleasing American IPA. It packs a lot of flavor and is easy to drink. 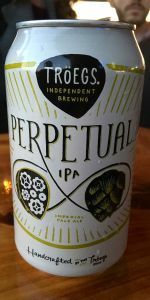 It's another quality brew from Troegs. On tap at a local restaurant in a 16 oz. lager glass. Dark yellow color, very little head, some aeration and lacing. Aroma of hops and citrus. Very inviting and refreshing smell. Oh my! Taste: Despite citrusy aroma, no citrusy flavor at all. This beer is all hoppy malts and barley. The largest taste that emerges is that of noble hops. Not much complexity, but delicious hops all the way. Mouthfeel: Some hoppy bitterness toward the end. Very pleasant and tasty. All in all, loved this beer. Gorgeous aromas of citrus and hops. Very narrow taste of noble hops, no citrus. Nice. I had this in a pint glass more than enough times but also had it in a tulip several times as well. The only difference I actually noticed was the fact that the head lasted longer in the tulip. The appearance was a decent orange to brown color with a one finger foamy head in both glasses. The smell was citrus hops, kinda coming through in a tropical sort of way and as it warms, there’s a nice melding of the caramel malts entering in. The taste was almost a perfect bittersweet gentleness running over my taste buds. There was a nice bittersweet aftertaste leading into a nice dry citrus finish. On the palate, it sat fairly light but also showed a decent quality of perhaps coming close to medium in the body. Still, I say there was a nice sessionability running about this one. The carbonation pummels my mouth into submission with the nice harshness of an AIPA but still the gentleness of a DIPA. Overall, really nice AIPA well worthy of coming back to when I can get it. Taste: Well hopped ipa, slightly bitter aftertaste. not very complicated. Deep gold with great clarity and a white head. Strong citrus and pine in the aroma with very little malt at all. Even for an IPA, the balance in the flavor is poor. Loads of pine cause for a sticky and resinous mouthfeel, which is not very enjoyable. The hops are too harsh and make it difficult to have more than one. Look: Pours a clean, clear, golden-amber with a two-finger white head which after dissipating leaves a thick ring for lacing around the glass. Aroma: Floral, grassy hops with sweet malt. Also getting some pine and orange notes. Taste: Definitely a pine heavy IPA, but in a good way. My expectation was that it would be more bitter, but the immediate pine resin yields to a somewhat sticky, sweet finish. Feel: Light body and sticky mouthfeel. Has me feeling like I bit off a chunk of Eastern Hemlock (PA's state tree). Great hoppy bitterness lingers through to the end and beyond. L: brilliant gold, 1” white head, thick, fluffy and lacy. S: American hops, malt, spice, light fruit, a little pine and citrus. T: Starts with malt, peach and plum, then citrusy hops, and finishes with citrus rind bitterness – has long lingering citrus. F: Medium body and carbonation. O: A big hoppy beer with a good range of hop flavors. Riding that fine line at the upper end of the alcohol scale, this "American IPA" is spot on with a dry malt taste and a complete hop dominance- this ale does its namesake in providing me eternal drinking pleasure... for at least a half hour. Strikingly clear in its pour, its golden body gleams as the last few bubbles race to contribute to the beer's frothy white cap. Long lasting, the beer's foam stance is sturdy and is slow to release. In its wake the head trails with blanketed intricate lace. Lighter than expected in color, the beer's appearance is exceptional! While the hop's presence dominates the nose with vibrant pink grapefruit, vine-ripened oranges, delicate pine and a boisterous grass note- its not without a ribbon of malt. A light honey and caramel scent gives the hop-fruit character a sense of being candied or sweetened. its simply and juicy and nearly teeth-churning aroma. Delicious in it hop-to-malt ratio, the malts actually strike first with a creamy caramel and honey taste- so delicate in fact that it almost seems pilsner-like. But just as the taste begins to waiver, here come the hops! Grapefruit, freshly zested oranges and lemon peels develop into a pleasant grassy and bitter taste. Seemingly of pine resin- the beer's final impression is of dry malt to prop up the cleanest and crispest hop taste imaginable. Malty-dry early and even drier late, the beer opens with that creamy-sweet note to buffer against all that bitterness and would-be astringency. But as the sweetness quickly fades and the carbonation subsides, the beer seems to skip over the middle in order to usher in a quick finish of hop dryness that's aided by alcohol evaporative cooling to ensure a dry and refreshed palate with every sip... ok, drink. A: Poured from a 12 oz. bottle into a pint glass. Sandy, orange-brown in color with an airy 1-finger white head. Some nice lacing appears as the head dissipates. Mostly clear with a light effervescence. S: Toasted caramel malt up-front with a nice pine hop finish. Light on the nose, with notes of balsam fir, lemongrass, toasty malts, crackers. T: Well-balanced with a firm malt backbone and a nice citrus/pine hope finish. A light linger that isn't very dry is a nice change for an IPA. Grass, earth, pine needles, and barley all lightly play together in the flavor profile. A nice flavor all-around. M: Lightly bodied for an IPA, but not insubstantial, this has a good session feel with a laid-back dryness that isn't overpowering. Good stuff all-around. O: A nice offering that does the IPA style well. At the same time, it's nothing too fancy or crazy. Right-down the middle, but in a nice, pleasant way. Big thanks to Stakem again. A- Pours a lightly hazed gold with a solid 2 finger frothy head that lasts quite a long time. As I drink this beer some of the foam never leaves the side of the glass it clinged to. Extremely good looking brew. S- The nose is already screaming bitter and I like it, lots of pine, grass and some fresh squeezed citrus. Also some nuttiness. T- Very forward hop presence as it should be, definite grass and citrus presents its self with a great malt character to bring it all together. M- Fairly light bodied and well carbonated. Extremely drinkable but also extremely flavorful. O- I drink a ton of IPA's being from Southern California and this stands up to some of the best IPA's around here. Thanks again Adam really glad I got to try this one, another great beer from Troeg's, I've liked everything I have had from them.